AFTER APRIL 24, 2015 your records will be placed in storage. When stored, there will be a delay in delivery as well as a modest retrieval and delivery fee. You will also have to sign and return a form (link to document below) or letter to release the records (REQUIRED by law, Sorry!) before that delivery process can begin. After April 30 closing date, information and instructions will be posted HERE explaining the required steps to obtain your records. We are providing a no-cost option for your records until April 24. After April 24, there are fees, meant to offset costs only, and those fees ARE permitted under law; see document at right. NOTE: This contact form can NOT be used to request your medical record. DOWNLOAD AND PRINT THE FOLLOWING RECORD RELEASE FORM TO RETRIEVE YOUR MEDICAL RECORDS. AFTER APRIL 24, 2015 THERE IS A $10 DELIVERY FEE. is an Orthopaedic Surgeon in Kittanning, PA with over 30 years of experience in taking care of Armstrong County residents. 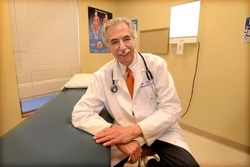 Dr. Sotos was featured in the Leader Times newspaper because of his new Walk-in and Cash Discount programs! "An East Franklin doctor doesn't want high deductibles, co-pays, or a lack of insurance to stand between patients and good health...."
"...The doctor said he has spent his entire 32-year career at ACMH Hospital and sees the cash discount and walk-in services as a way to give back to his community. If your problem is not listed, do not be concerned. This is not a complete list! We are now offering WALK-IN HOURS at a CASH DISCOUNT. Please visit our WALK-IN HOURS page for more details! We are now offering a CASH DISCOUNT. Please visit our CASH DISCOUNT page for more details! Now our patients can access their records online. Please visit our PATIENT PORTAL Page for more details! Please go to the New Patient Forms section, download the New Patient Information form and bring to your first visit. We look forward to seeing you! Dr. Sotos offers SYNVISC-ONE, the latest product available for treating knee joint arthritis with just ONE INJECTION instead of three separate injections. SYNVISC-ONE is injected directly into the knee joint to replace fluid damaged by arthritis, relieving pain and improving the joint's natural shock absorption. How to make your own Ice Slush Pack!